Gone are the days when you are forced to accept the chances of losing a few lures every time you go fishing. Nor do you have to avoid weed beds, Lilly pad or many other underwater obstacles. All of this has become possible with the help of some cleverly designed lures which successfully imitate small fish, frogs, worms, and many other types of baits which fish can’t resist. Using weedless lures is quite advantageous for anglers as they lessen the chances of losing lures to underwater snags. Also, since there are a large variety of weedless lures available in the market, you can choose those which are most suitable to catch specific fish. Another benefit is that these lures are highly durable and can be dragged through dense weeds without getting damaged or stuck. So, it can be used again and again with minimal chances of losing your gear. However, there are just as many options present out there which makes it a bit difficult to choose the one which fits well with your fishing requirements. To help you make this decision, we have shortlisted the best 5 weedless bass lures which we rate pretty highly. 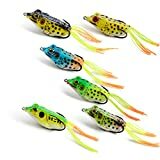 RUNCL offers a pack of five frog type soft fishing lures which can be used to catch many fish species, especially bass. You can choose from amongst many combinations of legged, single-skirted, double-skirted, and snakehead frog lures. Realistic design- The frogs have got 3-D eyes and stunning high-resolution patterns which helps it in perfectly matches that of real frogs. Not only this, but the frog exhibits lifelike swimming action which facilitates it in replicating real frogs to a high degree. Bite-resistant durable body- The soft hollow body of the frog is made of premium-quality PVC which is bite-resistant and also environment-friendly. Hence, you need not worry about the durability. Not only this, but its taste also imitates that of frogs. So, the fish don’t stand a chance before these delicious lures. Dual hook design- The dual hook structure ensures that the lure can firmly hold the fish. This increases the chances of catching the fish once it is trapped. The realistic features of these frogs make it highly lucrative for the fish and they just can’t resist it. So, using these new weedless bass lures, you can give a new level to your fishing experience. The frogs have two hidden hooks behind which make it more snag-resistant. These frogs are quite durable and can be used again and again. The PVC plastic material that has been used to make this product is environment-friendly. So, you wouldn’t be harming nature while using it. Since the five frogs all have different designs and colors, you can use any one of them, which is most suitable according to the surrounding environmental condition. For example, you might like to use a dark colored frog on bright days and a bright one in a dark evening, or vice-versa. One of the biggest drawbacks of these frogs is that they get filled with water. In that case, neither will they float well on the water nor will they be able to collapse well in the mouth of the fish to expose the hooks. 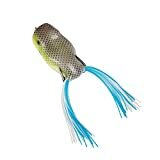 Multi Jointed Body - Connect with textile fabrics, moves flexible, simulation fish tail shows，will make you have a ultimate fishing experience. TRUSCEND presents the combo of three real-like trout swimbaits which is a multi-jointed fishing lure. This weedless bass lure is highly versatile and can be used for fishing in oceans, lakes, rivers, and almost any other water body. These can be used to target fish like Bass, Perch, Walleye, Pike, Muskle, Roach, and Trout. 3-D eyes and realistic features- The fishing lure has got an amazingly realistic appearance owing to its 3-D eyes and high-resolution design. Also, the three fish-lures in the combo have distinct, carefully chosen color patterns to be used in different surrounding conditions. 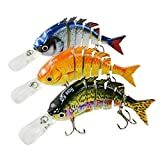 Multi-jointed structure- The fishing lure is constituted of multiple hard ABS plastic, attached together by a flexible strip which gives it the wave-like motion resembling real fish. Rust-proof mustad hooks- Each fish has two sharp mustad hooks which are made of steel and don’t rust even in sea waters. Noise gravity balls- These fish-baits have in-build noise gravity balls which makes it easier for you to throw them to a larger distance into the water and also provides them extra stability. Weight and dimensions- Each of the fishing lures measure 4.13” (10.5cm) from tongue to tail and weight 2.4 ounces (14g). The multi-jointed design along with space in between makes it swim like a real fish. There are two sharp mustad hooks which ensure a stronger hold on the prey fish. Since the combo contains five different colorful patterns, you can use any of them as per the environment setting. It may take some time and practice before you can perfectly produce all the required motions like swimming and diving. This is one of the best combos of weedless bass fishing lures which comprises of six soft frog crankbaits. The specialty of this combo is that the frog lures are of three distinct sizes. Lifelike design- With the 3-d eyes and colorful patterns, these frogs are designed in a way which gives a highly realistic appearance. Double-skirt- Each of the frogs has got two skirts which give flexible swimming actions which can deceive even the most cunning fish. Multiple sizes- The frog lures are of three different sizes. The largest size has a length of 5.5 cm and a weight of 14g. The medium size measures 5.0 cm and weighs 10g. The smallest size is 4.5 cm long and has a weight of 8g. There are two frogs of each size. This enables you to deal with different types of target fish. Soft but highly durable body- The frogs are hollow from inside and the soft body makes it easily collapsible. They, however, are very robust and durable. They can easily absorb the impact of fish-bites or pulling through heavy meadows. High quality claims- Since the company believes in providing the best services to their customers, they promise up to 365-day return and replacement warranty. One of the biggest pros of this product is its competitive price. You pay just $ 988 for six frog fishing lures, which is far less than most similar products. The combo consists of three size variants which provide you extra flexibility i.e. you can effectively target different sizes of fish with these. The different frogs have different colors and realistic patterns which enables you to do fishing in different types of environmental and lighting conditions. One of the biggest flaws of this product is that the frogs get clogged very quickly and then they don’t collapse well. This, however, can be dealt with squeezing them off each time you use them. TOPWATER BASS LURES - 3D realistic looking eyes and body make it a life like fish. Larger tongue design make it float at top water when throw into water. 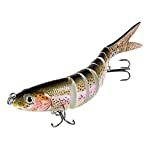 MULTI JOINTED BODY - The body pieces connect with textile fabrics allows this bass lures wiggles to side to side like a real fish would swim. This is a multi-jointed fish-type weedless lure and is a must-have for any tackle box. This is one of the best fish lures to replicate the appearance and motions of a real fish. Highly realistic appearance- The 3-d holographic eyes and high simulation patterns give it a lifelike appearance. Also, the different colors and patterns make it able to match any fishing environment. Unique large tongue- The unique long tongue of this fish is cleverly designed such that the fish floats when stop, but can dive up to four feet underwater when pulled suddenly. This further strengthens the illusion of a real fish which the prey fish can’t resist. S-swimming action- The multi-jointed structure of this fish along with spaces in between, allowing it to swim in s-pattern. Eco-friendly material- The crankbaits are made of environment-friendly material which can be reused. Built-in gravity balls- The fish comes with built-in gravity balls which enables you to throw it to longer distances and also provides it with extra stability. Also, the sound it produces attracts your target prey. The streamlined design reduces air resistance when thrown and also when swimming. Two Mustad hooks- The fish has two strong and sharp Mustad hooks beneath its belly which give you a sturdy hold on your preys. 3-d eyes, simulated patterns, s-swimming actions- all make this fish one of the most realistic weedless bass lures, making it a highly effective tool for any fishing excursion. This fishing is very tough and durable. It might sometimes lay on its side on water rather than swim. The Lunkerhunt frog series is composed of a number of options from bullfrog to green tea to Texas toad. 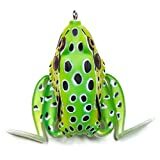 It is one of the most realistic frog fishing lures available. Ultra-realistic features- The Lunker frogs boast its 3-d eyes and high-resolution color patterns which make it look like a real-world frog. Lifelike actions- The frogs rest and move about on the water just like a living frog does. Its swimming legs stretch while retrieving and contracts while pausing. This swimming pattern resembles that of a real frog living and swimming in the water to a high degree of perfection. Wide gap hook- The frog has two sharp 4/0 wide hooks silently hidden close to both sides of the posterior part of its body. Highly soft body- The body of each frog is very soft and collapses when a fish presses it in its mouth, exposing the deadly hooks into its mouth. Large variety- The Lunkerhunt Lunker series consists of many different types of frogs which are not only amazing to look at but also performs as desired. Some of the frogs of this series include Bull Frog, Croaker, Fire Belly, Green Tea, King Toad, Leopard, Pearl, Poison, Rocky Toad, Texas Toad. The frog is highly realistic in terms of design and swimming pattern. This increases your chances of catching your target fish. Since these frogs come in a large variety of colors and patterns, you can choose from amongst these to fit any type of fishing environment. It can be used to catch a variety of fish including Bass, Pike, and Musky. The frog’s body, especially its legs, is not that strong and many customers have complained about legs being ripped off. The frog may sometimes get filled with water in which case it won’t float properly unless the water is squeezed out. Hence, we have come to the end of our review of the “best 5 weedless bass lures”. We discussed many features, pros, and some cons of those five fishing lures. Two of them were replicas of fish while the rest three, of frogs. Though these five bionic baits have been listed 1 to 5, it does not necessarily show the superiority of one over other. All these products have been included in this list because they all had some special features and had gotten wide customer acceptance. You can add one or more of them into your tackle box as they all could be useful in different situations depending upon the species of fish you are targeting, specific environmental conditions, or the type of fishing ground. Some species of frogs might prefer frogs over the fish and in such cases, using the frog baits will be more effective. Largemouth bass, however, doesn’t have any such preference as they are ferocious predators and they try to eat almost whatever they find floating near the surface. Moreover, each type of weedless lures gives a specific type of fun. While some type of fishing lure can work nicely for one, same may bring complete disappointment for others. So, the best way of finding out the one which suits you the best is trying all of them yourself one by one. So get out there with a spinning rod and one of these lures and see what you can do.